There are very few books that I can say have truly changed my life, but The China Study by T. Colin Campbell, PhD and Thomas M. Campbell II is definitely one that has. In this book Dr. Campbell explores the relationship between food and disease, specifically cancer, heart disease and diabetes. The western world is plagued by these health crises and the problem is not getting better, it's getting worse. After reading this book, I made huge changes in my own diet - I became a vegetarian, drastically reduced the amount of dairy in my diet, started eating more organic foods and started making more food from scratch. I'm a long way from where I want to be, but this book started me on a journey to healthier eating that has paid off for my family. My husband's cholesterol dropped 35 points after we made these dietary changes! My blood pressure came down and I started feeling much better. I highly recommend this book to anyone who wants to live a healthier life. 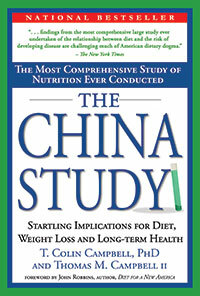 It's a bit scientific, but hang in there, as you read it you will be amazed at the findings of The China Study.